A pot pourri of spring, that’s what. Still lots of cilantro, radishes and green onions to take us in a Mexican direction. Still fragrant green garlic, for just about anything. And yippee, more asparagus and arugula! With ingredients like this, you can create almost anything. Like salad for an army (or a really packed potluck), chimichurri minus the parsley, and crispy, chewy chocolate chip cookies, in honor of National Chocolate Chip Cookie Day! Oh, wait, those aren’t from the veggie box. A funny and unprecedented thing happened this week as well. 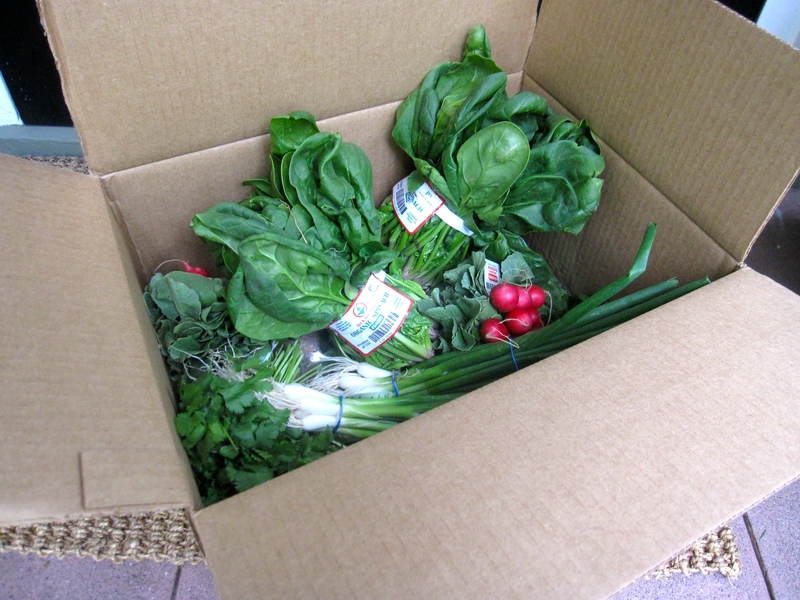 My doorbell rang, my Hood River Organic box greeting me on Friday as usual. There was the regular oohing and aahing, the taking in of the sights and fragrances, and the painstaking putting away (it always takes quite a refrigerator re-arrangement endeavor). Boy was it a surprise, then, when a few hours later, another veggie box appeared! Who knows how this happened?!? What I do know is there’s no send-backs, so now I’ve got quite the challenge cut out for myself. I’ve canceled next week’s delivery, and let’s see what I can do in the make-ahead (and freeze) department to salvage all of this spring bounty.